"This shot was taken with a Rollei E110, using conventional 110 print film. The shots were taken in a span of about 1-2 seconds, during which the plane moved about 400 feet horizontally. The prints were then trimmed and aligned, so that if the eyes view the images separately, they will form a 3D image. 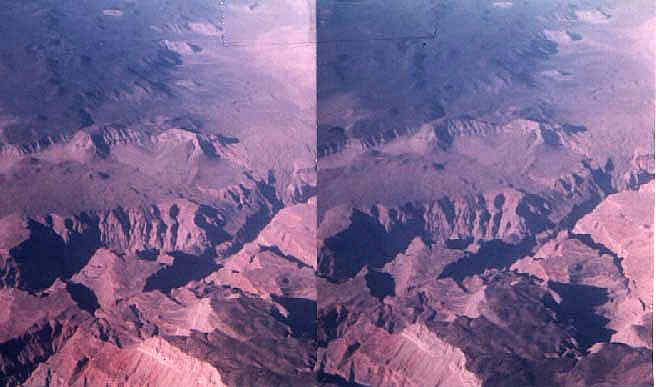 This gave the Grand Canyon some perspective and allows those who can "free view" to see the Grand Canyon as a true 3 dimensional object. This is called "hyper stereo" because of the exaggerated perspective. Nothing special about using submini here, except for another "interesting thing" one can do with them."